Grease an 8" x 8" square baking pan. 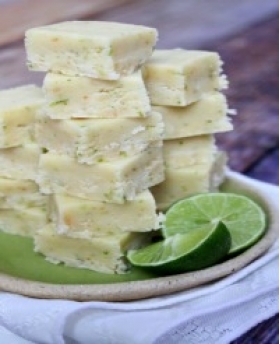 Combine sugar, lime zest, Olio Persian Lime Extra Virgin Olive Oil, lime juice, butter and sour cream in a 2 quart saucepan over medium heat for 5 minutes or until sugar is dissolved and mixture boils, stirring constantly. Continue boiling over medium heat or until a candy thermometer reaches 238 degrees. Remove from heat, stir marshmallows and white chocolate until melted and mixture is smooth. Immediately pour fudge into greased pan and let stand about 10 minutes until the top is firm to touch. Using a knife, score top of fudge to make fudge squares. Refrigerate about 1 hour. When cool and firm, cut out fudge.